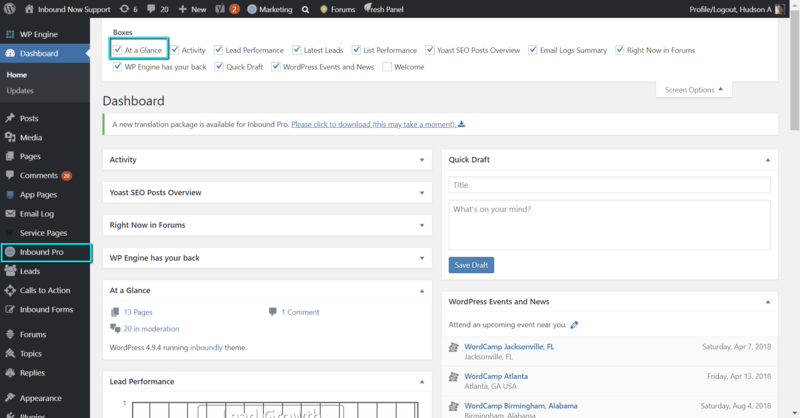 I just posted the following two messages at wordpress.org/support, and Hudson Atwell suggested I post it here to see someone could shine some light on a widget that went missing from the Dashboard (and from Screen Options) when Inbound Now Pro was activated. I know this forum’s about Call to Action, but I didn’t see an option for Inbound Now. I’m using the Twenty Seventeen theme in a relatively new install of WP 4.9.4, but I’m missing the “At a Glance” section of the Dashboard. When I pull down “Screen Options” while in the Dashboard, there is no listing (and no check box) for “At a Glance”. I tried using the “Dashboard Widgets Suite” to restore the default widgets, but didn’t have any success pulling “At a Glance” out of the ether. Where can I re-enable the widget’s display? One of the members of wordpress.org suggested I check for a plugin conflict (which I should have done first) :/ The result? You called it Keith. I compared that site’s plugins to another site’s – a site that didn’t have the problem. After reading your question, I killed all the plugins and lit them up gradually. Inbound Now Pro was causing the problem. Any thoughts on what might have been causing the issue? Thanks for responding to my reply here! I checked two of my test sites and the option to toggle ‘At a glance’ was there. Which really makes me curious to why it wouldn’t be there for you. In the next post I’ll offer to test onsite if you like. The topic ‘[Calls to Action] Missing widget – screen options’ is closed to new replies.